How much does it cost to travel to Athens? How much money will you need in Athens? €72 ($81) is the average daily price for traveling in Athens. The average price of food for one day is €20 ($22). The average price of a hotel for a couple is €79 ($89). Additional pricing is in the table below. These average travel prices have been collected from other travelers to help you plan your own travel budget. How much money do I need for Athens? Athens is the capital city of Greece and is home to a population of over 3.7 million people. It's most famous as the birthplace of Classical Greece and the history in the city is incomparable to that found anywhere. It became the national capital of the modern Greek State in the 1830s, before which it was just a small village with a very impressive history. The city was redesigned by architects and city planners and incorporated large public squares, lots of green space, and wide avenues. The city has had its ups and downs both economically and politically, but it remains a beautiful and impressive place to explore. The city hosted the 2004 Summer Olympic Games which led to major renovation to the transportation infrastructure and historical center. During this time the city's most famous classical era ruins and monuments were connected through a network of pedestrian streets, making for a wonderful tourist attraction. Like many of the touristy cities in Europe, spring and fall are the best times to visit. The summer is incredibly hot and dry and the winter occasionally sees rain or even snow. If you're tight on money though, the low season of winter can offer you many opportunities to save while avoiding the peak season crowds. 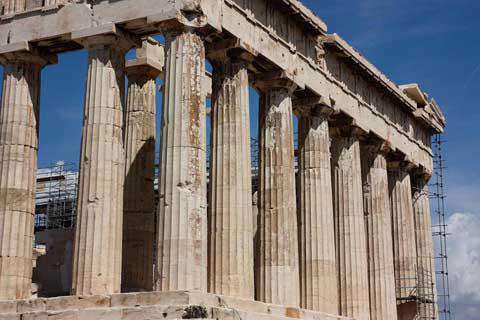 There are countless historical sights spread throughout Athens. Major landmarks include the Acropolis, the Ancient Agora, Syntagma Square, the Kerameikos, the Temple of Olympian Zeus, Panathinako Stadium, and Lycabettus Hill. In addition to the obvious famed sights, there are also many interesting Neoclassical buildings, interesting winding streets, and small Greek Orthodox churches that are fun to find and explore. Don't just check sights off in your guidebook, but make a point of looking around and wondering into the unexplored gems. Athens is a sprawling city that is enclosed by Mt Ymettos, Mt Parnitha and Mt Pendeli. There are also twelve hills, including the seven historical hills, within the city. In general, the tourist attractions are found in a small area around the city center and Syntagma Square. Spreading out from this square are the districts of Plaka to the south, Monastiraki and Thissio to the west, Kolonaki to the northeast and Omonia to the northwest. Plaka, Monastiraki and Thissio are all charming and interesting historic areas that sit at the foot of the Acropolis. The houses in these areas are from the 19th century and are restored to their original neoclassical style. Each of these districts has pedestrian streets, interesting shops, outdoor cafes, and historical ruins that date back to the city's Roman era. Kolonaki is an upscale, residential area that offers some upscale, boutique shops, interesting art galleries, and plenty of cafes. Omonia has undergone a gentrification since the arrival of the metro and now there are many students that live in this area. It is also where you will find the National Archeaological Museum. There are plenty of activities and festivals in Athens, particularly when the weather is pleasant. The Athens and Epidaurus Festival is held during the summer and there are a diversity of events that range from theater to performing arts and music. Another unique activity in Athens is to attend a basketball game. There are two major teams and tickets can be purchased at the stadiums. There are some very affordable and delicious meal options available in Athens. If you're looking for something quick and cheap, try the souvlaki. This is made with grilled meat, usually pork or chicken, vegetables, and Greek tzatsiki sauce. These ingredients are wrapped in a thin piece of pita bread and served with French fries. There is often an extra charge to sit at a table, so get the food to go and you can save a little money. Plaka has many different restaurants. Many of these cater to tourists and can be more expensive than those found elsewhere, but you'll likely end up having at least one meal here during your sightseeing. There are plenty of souvlaki shops. You can also head to Adrianou, which is on the north side of the Acropolis from Thissio. Here you will find many different tavernas. These are also touristy and a little expensive, particularly if you find one with views of the Acropolis. Public transportation in Athens continues to be renovated following the Olympic Games in 2004. It's very affordable and one ticket will let you travel on all modes of transport including the metro, suburban trains, trams, trolleybuses, and buses for about an hour. There are also full day and weekly passes available. Public transportation in the city is prone to strikes, in which case traffic can become frustratingly congested. The metro system is relatively new, opened in 2001, and the stations are quite impressive. There are three lines that currently make up the system. Line 1 connects the city center with the Peace and Friendship Stadium. Line 2 connects the city center with the coastal zone, and Line 3 runs along the coastal zone.There are also buses and trolley buses that run throughout the city. This buses are convenient and generally reliable, and are a good and affordable option to visit parts of the city that are not accessible by metro. Public transportation in Athens has continued to improve in recent years. You can purchase a basic ticket for about 1.40 euros that is good for any means of transport (metro, trains, trams, buses, etc) with transfers for an hour and a half. A twenty four hour ticket is roughly four euros and for ten euros you can get a ticket good for a week. Workers strikes are not uncommon in the public transportation system so research and plan ahead. There is a good chance that there will be a strike at least one day if you are in Athens for a full week.